Experience full body, high-intensity training, with a creative and edgy twist. Uniquely tailored workouts. Everyone in our gym has their own unique “why” for training with us – so why would it make sense for our workouts to be one-size-fits-all? Our members love that our workouts are designed around their abilities, endurance, and fitness goals. Lots of class times. We offer a wide range of workout times so our members can join in when it works for them. Bad timing should never be the reason for missing what could be one of the most invigorating parts of your day. The awesome support. When you’re surrounded by people who are looking to be better than they were yesterday, great things happen to your own motivation. Our fitness family is second to none in the culture department. When you come in for your free one-on-one training session, you’ll see exactly what we mean for yourself. The gained confidence, improved body composition, and health benefits. These seem like a no-brainer benefits to joining a gym, but unfortunately more times than not, you won’t actually experience these from your average gym. 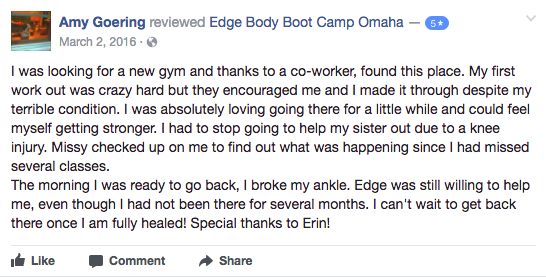 Edge Body Boot Camp puts the personal success of our members as a #1 priority. If you don’t see results, we’re going to get to the root of it! That’s a guarantee. Fill out the form to schedule your free 1-on-1 training session. We’ll get back to you ASAP to find a time that works for you.